In the hours after today’s London Marathon, people have been declaring this beautiful moment in which a runner picked up a collapsed fellow competitor and carried him over the finish line as the highlight of the race. That was lovely! That is not my highlight of the race. 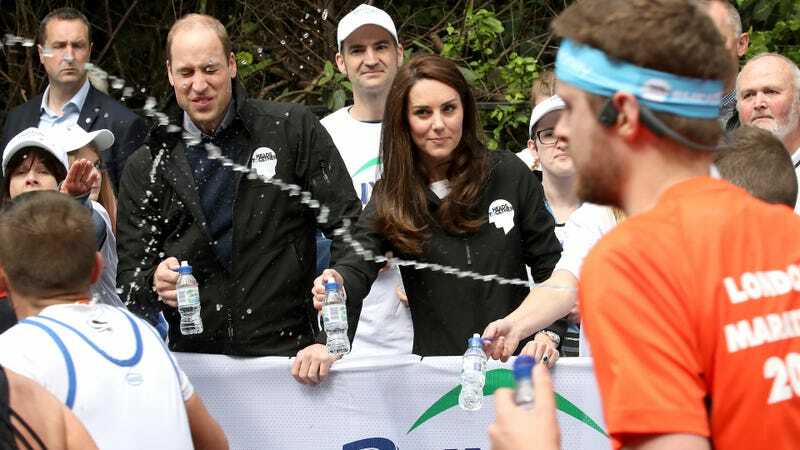 No, my highlight of the race comes from this runner—either very brave, or kind of dumb, or maybe somehow just incredibly clumsy—who squirted water at Prince William and Kate Middleton. But the runner is not the author of the highlight; that would be photographer Chris Jackson, who managed to perfectly capture this moment of William’s dumb splashy derp face while Kate is cool and collected and maybe even smirking just a little with her perfectly shiny hair? I love it. I love it so much.